This fruity layered pudding using fresh custard and yogurt desserts is really simple to prepare. Keep aside a handful of blueberries for decoration, then place the remainder in a small pan with the caster sugar and lemon juice to make a compote. Bring to the boil, then reduce the heat and simmer for 3-4 minutes until the berries start to burst and release their juice. Remove from the heat and cool completely. 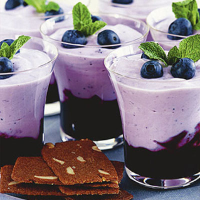 Place the blueberry yogurt desserts, custard, fromage frais and lemon zest in a bowl and stir to combine. Spoon the cooled blueberry compote into the bottom of 6 glasses, then top with the custard mixture. Chill for 30 minutes or until ready to serve. Before serving, decorate with the reserved blueberries and a sprig of mint. Serve immediately with almond thin biscuits. Prepare the compote the day before and refrigerate until needed. For a more indulgent version, replace the lemon juice with 1-2 tablespoons of crème de cassis.